It feels as if blogging were from a completely different lifetime. I have been away from this space for so long, and so much has happened in life since the last time I wrote, it's hard to know where to begin. I suppose I should begin by saying hello - hello to all (any?) of you who may still have my blog in your feed, long forgotten. I'd like to say I'm back, but perhaps only time will tell. What I can say is that now, after several years of - what was it, burnout? suffocation? apathy or disinterest? - whatever the case, I feel as though I am finally beginning to be excited about knitting again. It's a bit funny how you can take something you are so passionate about and as soon as you put a price tag on it, as soon as you depend on that passion to pay the bills, it begins to slip through your fingertips. And so that's where I found myself after 2.5 years working full-time at a yarn shop. I talked about knitting nonstop for 8 hours a day - usually on the weekends, too. When I wasn't at work, I was working at home - designing patterns, knitting samples for designers, for yarn companies, for the store... doing finishing work for customers or planning the next class I was going to teach. By the end of the day, when I could find a rare half hour of time for myself, I had no energy left to think about knitting. No passion left to dream about my next project. No time to knit for myself - to knit for fun. No, it was deadlines, only deadlines and after a while, that's all it meant to me. If you'll indulge me for a bit longer, there is still quite a bit more to update you on as I have been gone for so long! There will be knitting in the post too, have no fear. Since I last posted here, it's as if my entire life has changed. Shall we see how? And a full marathon here in the Twin Cities. And see that pup I'm sitting with? His name is Toad, and I adopted him. Actually it would be more accurate to say that we adopted him, my husband and I. Because I also met a man, fell in love, and got married! He's a lovely man and I count myself lucky for each and every day I get to spend with him. We met for the first time two years ago when he came into the yarn shop to take a knitting class! If that's not fate, I don't know what is. And we also bought a house. But that was before we got married, and before we adopted Toad. Of course, there can't just be one dog for two people, so we also adopted Hank. He's quite a bit bigger than Toad. But they both make excellent knitting companions. And here we are! We made it to the knitting! I'm glossing over most of the items I've knit over the past two years partly because they seem so long ago, mostly because they were samples for designers, and quite frankly because they are in the past and I am looking ahead. What I'm knitting in that picture is a Christmas stocking for my husband. Christmas is my favorite holiday and I wanted to remember this one forever - our first Christmas in our house, with our dogs, and because we got married on Dec. 23, our first Christmas as a married couple. Of course, in true knitter fashion, I finished his stocking shortly after Halloween, but didn't quite get mine done in time. Give me another week or two and it will be finished, I'm sure of it. Can we talk about the knitting? I used (am using) Rauma Finullgarn and I have to tell you, this is quickly becoming one of my favorite yarns for colorwork. I love how plump the yarn is and I think it can be knitted quite successfully on a number of different needle sizes. 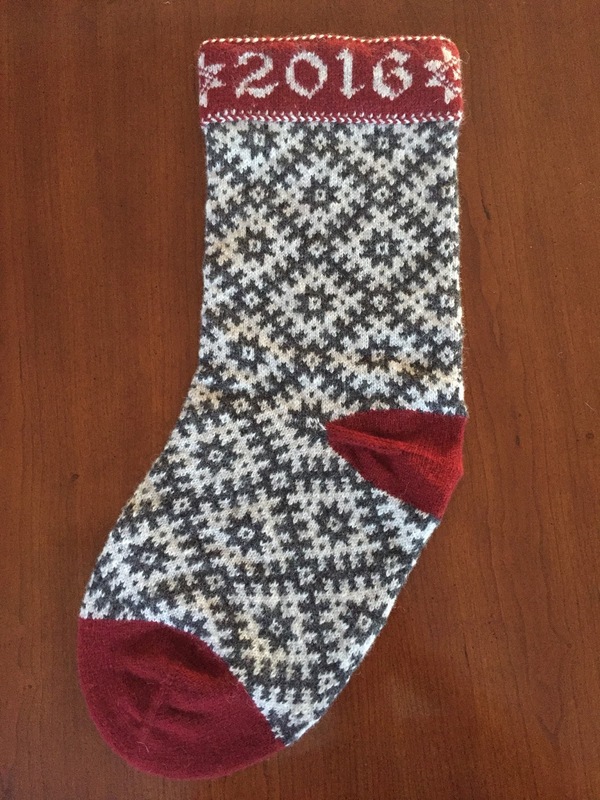 Here the majority of the stocking is done on 2.50mm needles, but the toe and heel are done on 2.00mm. The pattern itself comes from one of my current favorite knitting books, Latviesa Cimdi - "Mittens of Latvia". I bought my copy from a store in Latvia whose website I couldn't read before it became available in English, but it is now readily available with an English translation (I can only look at the pretty pictures in my book, but I don't mind. Somehow I find it to feel a bit more authentic that way.) As I am such a sucker for traditional knitting techniques and patterns, it thrills me to no end when I am able to include references to traditional knitting in my own projects. Here we have a mitten pattern from Latvia, two-color braids from Estonia, and a few Norwegian stars on the cuff. And because I like details, I couldn't help but add a bit of candy cane striping to line the cuff. If you're going to spend the time designing and knitting a one-of-a-kind item, why not go all the way? I will admit, I'm not happy with that heel. I knitted it and ripped it out twice while cursing myself for designing as I go. 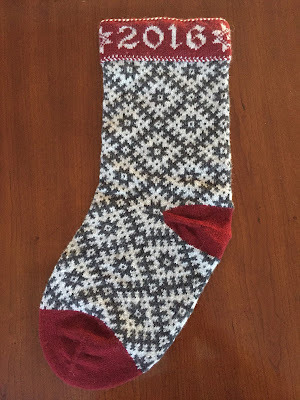 I've never knit a stocking before, I didn't even know what the proportions were going to be until it was done, but I'm happy with the finished product overall. Mine will look exactly the same, except I flipped the background and contrast colors in the body patterning. Matching, but different - just like us. And there you have it in a nutshell. I've run more miles than I care to think about, I bought a house, started a new career, adopted a few dogs (and continue to foster more! ), married the love of my life, and have rediscovered my love of knitting as a hobby, as a connection to the past. And now that we're here in the present, I am so happy to say that I am thrilled to be here! I know now that I will carry my knitting into the future as well - I'll be sure to tell you all about it! Congratulations Peter on all that is new and wonderful. I look forward to updates on how your life is evolving. Welcome back! I've read your blog for years but don't think I ever commented. Glad to hear life is going so well! Congratulations and Happy New Year to you both! It's very nice to know you're doing well and there are so many wonderful things happening for you! Hi there! Let us give thanks for feed readers and the ability to see when a blog comes out of hibernation. Congrats on all the many wonderful things that you have done while you were away. And I love that stocking! Thank you for coming back to share your life and knitting. Congratulations on all the wonderful things that have happened in your life. One question...is music still an active part of your life? It's great to see you back on here, and great to hear you're so happy! Several years ago, it was hard to imagine all this. What a gorgeous stocking! I love your judgment on the striping inside the hem. I'm knitting with Rauma right now, too. I fear I set it aside so long that my gauge has changed, though. Happy new year, and happy knitting! Love those doggoes! So cute! And Congratulations to you and your husband, your house, your family, your career and being able to love knitting again! Wow Peter! First congratulations to the marriage! Finding someone special is wounderful. I wish you many, many happy years together. The dogs are gorgeous and I thinkt it is great that there are two of them, so that they can keep eachother company. All the best to all four of you! I was just thinking about you last night, wanting to get your address to send a note to you two! So happy. Why I thought of you was the clarinet part in Beethoven's First Piano Concerto. I miss seeing you. I understand about the fun going out of work when you have to pay the bills. I love my day job! Is it ok to send you a hug? I'm not really touching you, after all! Sorry I'm late to the party, but I had to say what a wonderful end to a previous life, and beginning of a new one! A house, a husband, cute pups, and renewed interest in knitting- sounds all good to me :) Glad you're back at it!